Figure 16-2: Arabia’s art-district ambiance is enhanced by outdoor sculptures like this one, called Desert Wind. Helsinki is transforming its docklands and industrial centers into compact multi-use neighborhoods, promoting efficient, energy-saving infrastructure and accommodating a swelling population without sprawling into the countryside. While growing up, this capital city of 600,000 people is also extending a network of green fingers radiating from the Baltic Sea including a corridor encompassing dozens of islands, an open bay, a cove with a Natura 2000 site and a river valley that links with Eco-Viikki, Finland’s largest sustainable development. Helsinki, together with the state government, owns 80 percent of the land within its borders (URBED 2001). Roughly 30 percent of housing production occurs on land leased from the city using plans prepared by the city in accordance with price restrictions and quality standards established by the city (Rinne, 2009). The city uses the annual income of 200 million euros from these ground rents to finance public transportation and other infrastructure improvements (URBED, 2011). This control of the development process greatly facilitates the implementation of Helsinki’s plans. Figure 16-1: A canal and its adjacent pedestrian paths create a green spine for the former harbor/industrial district of Ruoholahti. The Helsinki plan aims to relocate many older port facilities from locations near the city center, creating infill sites for sustainable development (Jaakkola, 2012). The revitalization of the West Harbour area began in the early 1980s in Ruoholahti, a former harbor, warehouse and industrial district roughly one mile west of downtown. To enhance its waterfront image, the city built a canal flanked by greenspace and pedestrian paths that link playgrounds and other amenities here. The Ruoholahti project area is now home to 6,000 residents and 12,000 jobs served by buses, trams and metro rail (Helsinki, 2015). In addition to port relocation, Helsinki is revitalizing industrial brownfield sites. The neighborhood of Arabianranta surrounds Arabia, at one time Europe’s largest ceramics factory. After years of decline, Arabia announced in 2015 that the few remaining jobs at the Helsinki plant would be relocated to other countries (Jokinen, 2015). However, decades ago, Helsinki began planning for this area to transition from a manufacturing district to the Baltic region’s preeminent center for art and design. 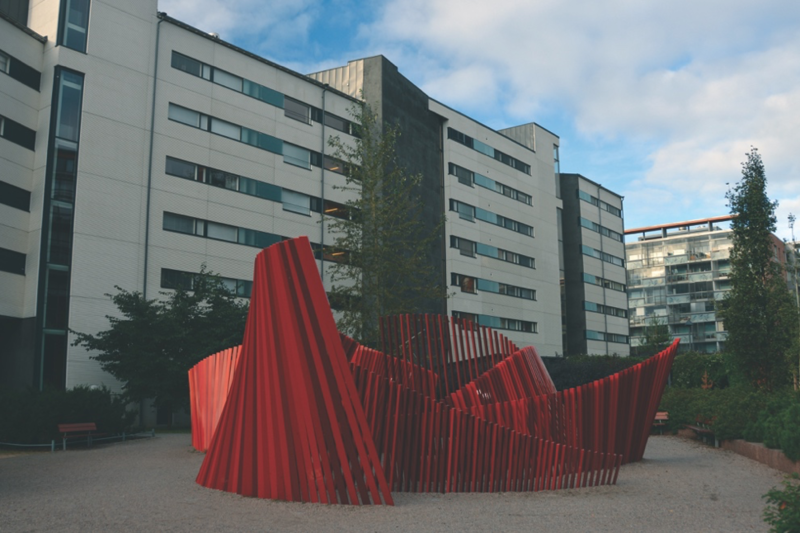 As of 2009, Arabianranta was home to the largest art university in the Nordic countries as well as an art museum/gallery, music conservatory and three art libraries. Artists participated in the planning of Arabianranta and a percent-for-art requirement has produced a district that now draws visitors to its public art trail (Helsinki, 2009). Redevelopment here was also carefully planned to protect the environment. For example, storm-water from the district is captured in rain gardens incorporated within the Arabia waterfront, a component of Helsinki’s green-finger network offering recreational opportunities and non-motorized transportation options while safeguarding the adjacent Vantaa River and the nearby Lammasarri Natura 2000 site. North of Arabianranta, the 2,791-acre Viikki district protects roughly three quarters of its land area for recreation and nature conservation, including a segment of an evolving greenway extending south to the city center and north to larger urban forests including Sipoonkorpi National Park (Renne, 2009; Helsinki, 2010). In addition to the science campus of the University of Helsinki, this district is home to a neighborhood of homes, schools and day-care centers known as Eco-Viikki, Finland’s largest sustainability laboratory (Joss, 2011). Eco-Viikki’s structures save energy using building orientation, rooftop solar collectors and photovoltaics. Multi-story apartment buildings here are separated by linear open spaces that provide solar access, rainwater retention, passive recreation and garden plots for nearby residents (Rinne, 2009). Any rainwater not used for gardening is channeled into Viikinoja stream, a former agricultural ditch that has been relocated and reshaped into a meandering brook (Helsinki, 2010). 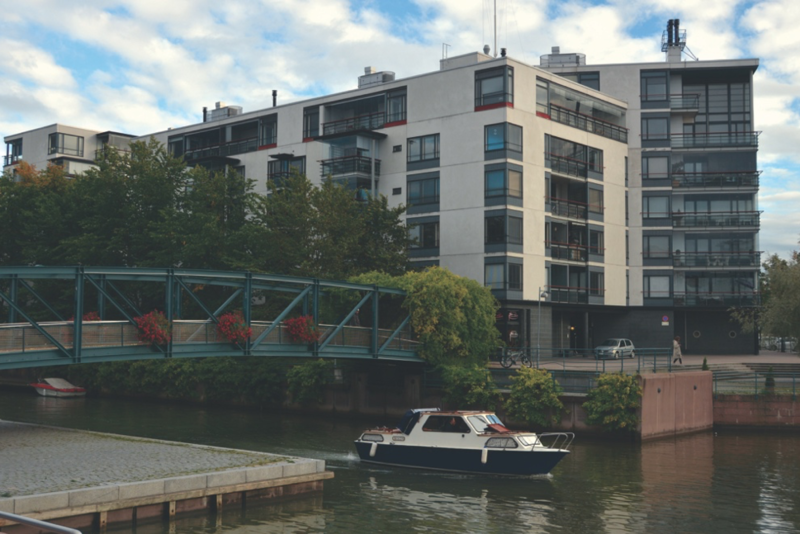 In a 2009 presentation, the Viikki Project Manager stressed that the “… sustainability of a residential area depends first of all on the lifestyle of its inhabitants.” (Rinne, 2009). In 2005, some residents reported that Eco-Viikki converted them to a more ecological way of life while others were relieved to find out that, despite the emphasis on waste reduction/recycling, energy/water conservation and gardening, the Eco-Viikki lifestyle was pretty similar to that of other Finnish neighborhoods (Helsinki, 2005; Rinne, 2009). 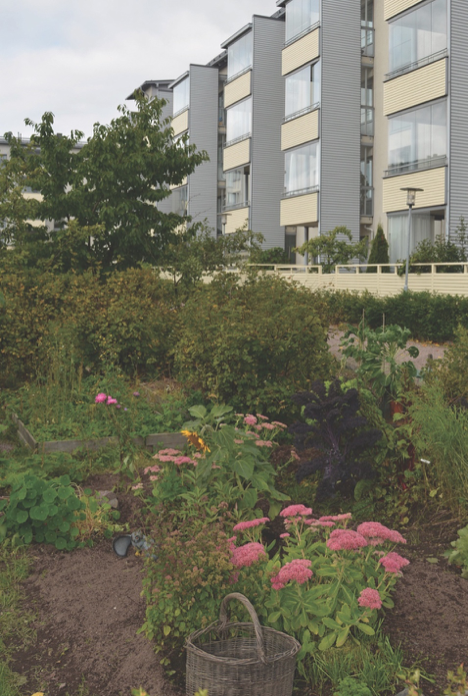 Figure 16-3: Eco-Viikki’s green fingers provide solar access as well as garden plots for nearby residents. Public and private green areas cover an estimated 46 percent of Helsinki (Jaakkola, 2012). 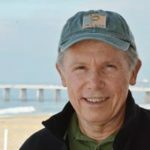 For over a century, the city has been working toward greater connectivity of its green areas. In 1914, the city adopted a plan to create a green structure in which local parks and other public facilities are linked to linear parks called green fingers that radiate from the waterfront to the farms and forests surrounding the city. Helsinki’s 2050 City Plan maintains this tradition by recognizing that densification increases the need for a continuous network of accessible, quality recreational open space (Helsinki, 2013). In addition to linking parks and preserves, Helsinki wants its green fingers to connect recreational centers, schools, shopping districts and workplaces (Jaakkola, 2012). The biggest green finger is Central Park which contains four nature protection areas in its northern segment and connects at its southern end with Cultural Park, home to several public facilities including the Opera House, the botanical garden and the Helsinki Music Center (Helsinki, 2015a). In 2002, the City Planning Department introduced the concept of a highly-ambitious green finger called Helsinki Park, incorporating a river valley, a cove with a Natura 2000 site, the bay adjacent to downtown Helsinki and the archipelago of islands that lie south of the city center in the Baltic Sea, including the historic Suomenlinna Island Fortress, a UNESCO World Heritage Site (Helsinki, 2015b). Arabia Story. Retrieved on November 29, 2015. Helsinki. 2005. Eco-Viikki: Aims, Implementation and Results. Helsinki: City Ministry of the Environment. Helsinki. 2009. Walking in Arabianranta. Helsinki: City Planning Department. Helsinki. 2010. Viikki Science Park and Latokartano Guide. Helsinki: City Planning Department. Helsinki. 2013. Helsinki City Plan – Vision 2050: Urban Plan –The New Helsinki City Plan. Helsinki: City Planning Department. Helsinki. 2015b. Undated paper titled Green Areas System in Helsinki. Helsinki: City Planning Department. Retrieved on December 1, 2015 from http://www.kirjavasatama.fi/pdf/southharbour_greenareassystem_helsinki.pdf. Jaakkola, Maria. 2012. Helsinki, Finland: Greenness and Urban Form in Beatley, Timothy (ed). Green Cities of Europe. Washington D.C.: Island Press. Jokinen, Heikki. 2015. National industrial icon Arabia ceramics factory to close down. Trade Union News from Finland: April 11, 2015. Retrieved on November 29, 2015 from http://www.heikkijokinen.info/en/trade-union-news-from-finland/887-national-industrial-icon-arabia-ceramics-factory-to-close-down. Rinne, Heikki. 2009. Green Affordable Housing Development Case Eco-Viikki, Finland. Presentation by Project Manager, City of Helsinki, June 25, 2009, Washington, D.C. Retrieved on November 26, 2015 from http://www.upv.es/contenidos/CAMUNISO/info/U0511281.pdf. URBED. 2011. Learning from Helsinki and Stockholm. London: URBED.